The development and expansion of our eleven hectare Flamborough site near Bridlington during the 1990s. In 2008 BRSS supplied through BSPS four 20 meter diameter by 15 rings, two 20 meter diameter by 16 rings main flat bottom storage silos which will give a total storage capacity of 24,000 tons of malting barley. 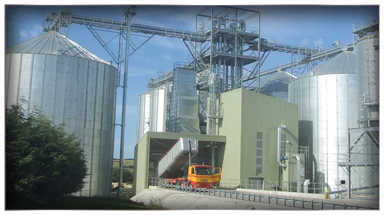 In addition to this we have supplied; four 8 meter diameter by 13 ring hopper bottom pre-storage silos which give a further storage capacity of 1,800 tons of storage and two lorry load out hopper silos on supporting steel work, one corrugated and one smooth wall. In 2010 we supplied a 8 meter diameter by 8 ring hopper bottom silo which is one a lorry load out support structure which can hold 300 tons of barley.